Our universe is enormous. There is so much space outside, it’s mind blowing. The nearest object in space from Earth is the Moon. If you were to fly there in a jumbo jet, it would take about 385 hours to get there, or 16 days. The Sun, although just as big in our sky, would take 17 years to reach. And the nearest star, Alpha Centauri A, is found at 4.2 light years from Earth. This distance is so huge, describing how long it will take to reach with a jumbo jet is just silly, but let’s give it a go: about 6 million years. Astronomers have now found a star that is much farther away than Alpha Centauri A, 2 billion times as far! MACS J1149 LS1, or Icarus for close friends, is a blue supergiant that recently was discovered and is the most distant star ever observed. With 9 billion light years, Icarus is at least 100 times farther the next-farthest single star ever observed. Astronomers have detected constellations and supernovas at these distances, but never a single star. This blue supergiant is a lot bigger than our Sun and a lot brighter. From such as distance it is hard to determine the exact size, but it is at least 33 times bigger. The light it emits can be a million times as strong as sunlight. Despite the fact that this star is bigger than the Sun, this alone would not be enough for astronomers to be able to observe it. A team of scientist were studying and collecting images from a supernova since 2004. When examining the images collected, they noticed a point that first appeared in 2013 and that became much brighter in 2016. It soon became clear that this was a single star. But how could a single star that far get noticed? 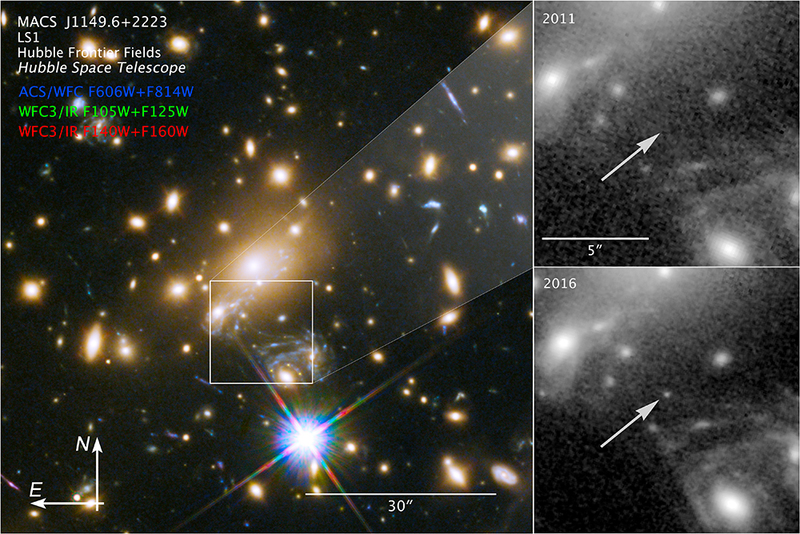 It seemed that the light coming from MACS J1149 LS1 was magnified more than 2000 times by a process called gravitational lensing. With this process, the light gets magnified by constellations and star clusters that find themselves in between the observation point on Earth and the star. These constellations and clusters work as a magnifying glass as their gravitational pull helps the light of Icarus to travel farther. With gravitational lensing the light gets bend and travels towards the observer. The amount of this bending has been part of Einstein’s theory of relativity. And through that process, astronomers have been able to determine the source being Icarus. The light they found in the images was coming from it when it was about 30% of its current age. If Icarus is still alive, and let’s stay positive and believe it is, it will now be 13.8 billion years old. But the truth is, we will never know if Icarus is alive today, as it will take 9 billion years for its obituary to arrive to us.